Monkey Fist Tattoo is a locally owned Tattoo studio which opened in July of 2010. We are located in North Denver’s Tennyson art district, Monkey Fist Tattoo is a full custom, award winning tattoo studio that caters to both appointment and walk-in customers. Our Denver area artists: Ortavio “OG” Griego, Isaac Lucero and Tony Lucero provide our customers with quality, clean and sterile artwork. If getting into the studio presents an issue our artists frequently travel to multiple cities for conventions and high end clientele. 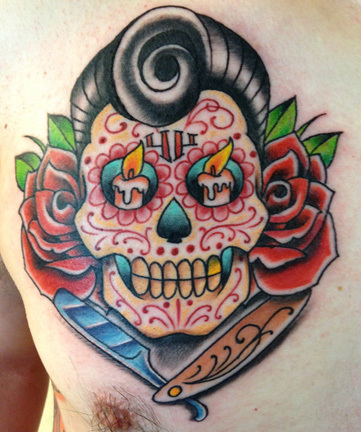 We are open 7 days a week Sunday noon- 8, and Monday – Saturday from noon until 10p.m., for all of your tattoo needs. Please contact us for your free consultation and to schedule your next appointment. Monkey Fist Tattoo uses the highest quality pigments found in the industry. These pigments are not cheap and not easy to find. The reason we have been able to stay in business for so long is because we use nothing but the best. Our work is guaranteed to stay bright and sharp forever. Just about any design you can think of can be made into a beautiful tattoo. You are more than welcome to bring in your own design or pick one of our hundreds of thousands of designs that line our walls. If you already know what you want, great, it is very simple to convey your idea to our artists. The easiest way is with a picture. It doesn’t matter what the picture is on (keychain, t-shirt, book, drawing…etc.). Even if you can’t draw, our guys still love to do the custom work. Just describe it well or even bring in a stick drawing. We can turn it into your dream tattoo on paper right before your eyes! Monkey Fist Tattoo experience, it can all be corrected. Why wait? We fix other tattoo shop’s mistakes every day! Leave plastic on for one hour. Wash tattoo with antibacterial soap and apply A&D Ointment lightly. Use A&D for three days, three to five times a day. After three days use unscented lotion for two weeks. Enjoy!